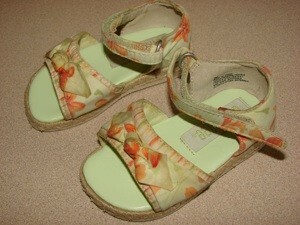 I have a used pair of little girl's Gymboree espadrilles. They have a pretty floral (cotton?) print bow over the top of the foot area that has quite a bit of dirt on it, as does the heel of the shoe. These shoes match a beautiful swiss dot sundress, so I really want to clean them. I know I could make them sparkle if I could soak them, but I'm afraid to do that. I realize they are scary looking, but I know they can be improved. Any ideas on how best to bring them back to life safely? Thanks very much! Try a Mr Clean eraser, or if that doesn't work a laundry stain remover and scrub with an old toothbrush. Don't soak the shoe-it will probaly fall apart if you do.